“All Inclusive” means you pay one bill for your rent and utilities—electric, cable, and internet—so you're only responsible for one payment. It’s included in your rent! We're located 2-minutes walk from the Georgia Tech trolley stop at Publix Supermarket. We're close enough to campus that many residents ride their bikes or walk to class, too. We're just one block away from the Midtown MARTA station. How long are your leases? Are short term leases available? We offer 12-installment leases. We do currently offer a limited number of short-term leases. Many residents who are unable to fulfill their lease term choose to sublet their apartment. What is a guarantor? Is there additional paperwork required? As a part of our lease agreement, we require each student to have a Guarantor. A suitable guarantor is at least 25 years old and a resident of the United States. If you do not have a guarantor, you will need to pay 1.5 times the rent as a self-guarantor. Our leases require a guarantor. However, if you cannot find someone as a guarantor (see our website www.100midtown.com for required qualifications), you can pay a self-guarantor equal to the cost of one and half rental installments. The deposit is due within 14 days of signing the lease and must be paid in full. Contact 100 Midtown's office for information on how you can set up your own account with Rent Plus and start building your credit immediately! 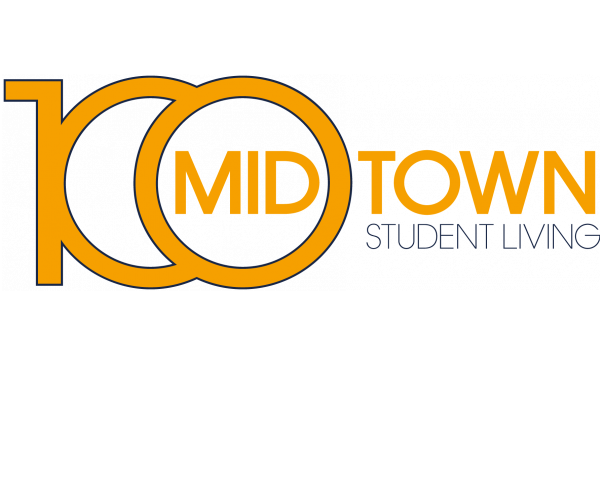 Every resident completes a detailed roommate profile questionnaire prior to moving in, which 100 Midtown uses to match compatible residents based on their responses, including sleep habits, pets, lifestyle, schedule, etc. An individual lease means you are only responsible for your rent and bedroom, with shared responsibility for common areas. So if a roommate transfers to a different unit or moves out, you don’t have to worry about a thing! Your rent will not go up and you will never be financially liable for your roommates. What documentation do I need if I don’t have a Social Security Number? If you do not have a Social Security Number, then you are required to turn in an I-20, which is generally given out by the University. We also ask to see your Passport. What is the Community Rewards program? Community Rewards is a fun and easy way to earn points and get rewarded for being a part of our community, and it's the #1 resident loyalty program in the country! Earn points. Win prizes. It's that simply. Seriously, get rewarded just for living at 100 Midtown. Log in to your Resident Portal account to sign up now! Where are the closest shops/food stores/restaurants? There is a Publix grocery store just one block away, but there are many restaurant options nearby in Midtown. Technology Square is just a short walk from 100 Midtown and features a number of restaurants and shops. No, pets are not allowed on premises. Smoking is not permitted in your apartment, hallways, or common spaces inside the building at 100 Midtown. However, 100 Midtown has an outdoor patio with plenty of seating if you do smoke. Can Financial Aid cover rent? Unfortunately, we do not defer rent because of financial aid. The first installment of rent is due prior to your move in day, with the following installments due on the first of every month. You can pay rent in advance at any time if you use financial aid to avoid being late. When is rent due? Do you send me a bill? How can I pay? Rent is due on the 1st of every month. We do not send a bill to remind you prior to the first. However, you can check your balance on our website, under the “resident portal”. It can be paid online via credit card or e-check, or in person at the office with check or money order. Can I fill out all the paperwork online? We can take you through the process from start to finish online if you wish. From application to lease signing, we make the process as easy as possible for you to complete from anywhere in the world. However, if you would like to complete the process on paper, you can stop by our office and our staff would be more than happy to assist you in the process.